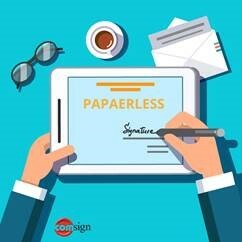 Switching from paper to digital signatures saves Bank Mizrahi 9 million pages a year ! Bank Mizrahi Tefahot recently completed the digitization of customer service at its branches. In a nation-wide project, carried out by ComSign, tablets that were installed at the branches now enable the Bank’s customers and employees to sign electronically on various forms. As part of this large-scale project of completing a new banking application that is part of the Atafels system, a “paperless branch” solution was implemented on tablets at the Bank’s counters throughout Israel. According to Danny Dotan, Head of Banking Applications in Communications at Mizrahi Tefahot Bank: “this project enables us to save paper and shorten service times. In the past year Mizrahi Tefahot Bank has saved the printing of 9 million pages, which saves more than a thousand trees each year”. According to Zeev Shetach, ComSign’s CEO and founder: “The role of technology is to make it easier for us all to perform daily activities, and thus we take pride in dramatically improving the quality of life of the country’s citizens in recent years in various areas of life,”. There is no doubt that routine banking operations must be carried out in a convenient manner, as well as the approval of medical prescriptions, the signing of extensions of cellular packages to Israeli citizens residing abroad, tax reports, various reports to municipalities, and many other services that were and still require outdated and complicated practices. Bank Mizrahi-Tefahot Bank is a pioneer in this field. The completion of the project attests to a real understanding of the banks senior management to its customers needs.